My first trip to Switzerland was for a pretty stressful business affair. The hearing was in Geneva, not my favourite Swiss destination but even then I remember getting out of the hearing room during breaks, walking out to the balcony and being amazed by the beautiful mountains surrounding the city and thinking how you could be in the most business oriented city of Switzerland but still have such easy access to the amazing outdoors and landscapes. That view and thought remained with me and a year later, I took my first leisure trip to Switzerland, which has since then been followed by many others. In addition to the entire Scandinavia which is hauntingly beautiful, Switzerland is definitely the other European destination that I feel emotionally connected to. There are many regions in Switzerland that I love and I will be writing about each one of those special spots in separate posts. 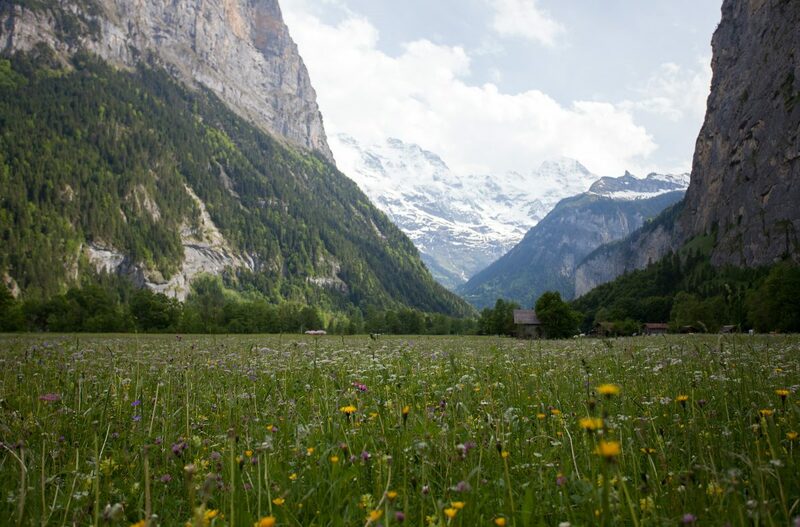 This first post is dedicated to Lauterbrunnen Valley – my absolute favorite place in Switzerland. I love many different parts of Switzerland but if I have to name just one place – it would be Lauterbrunnen Valley. Lauterbrunnen always reminds me that while I love sea and water, it is the mountains that I am truly in love with. Lauterbrunnen is a very small town (that you can cross on foot in literally five minutes) sitting right on a beautiful valley down from the famous peaks of Switzerland including Eiger and Jungfrau. Its unique location makes it a perfect base for many outdoor activities. Among those various activities, my favorite is to get up early and go on a bike ride through the valley when there is no one else around (except for some wingsuit jumpers that I ran into during my last trip!) – the entire valley is surrounded by wildflowers and also waterfalls. It sure feels dreamy. From Lauterbrunnen, you can also take a cable car up to the mountain village of Murren, which hosts number of nice hotels and restaurants with breathtaking mountain sceneries. My favorite part is to get off at Grütschalp (last stop of the cable car) and then instead of jumping on the mountain train – walking the mountain path to Murren with an easy 1,5 hour hike (sometimes much longer due to inevitable photo stops). The path makes you feel like you are walking through the clouds – you feel so close to the surrounding peaks. It feels like you can actually touch those peaks. Once in Murren, I will either grab a quick lunch or move right away down to the tiniest Swiss village of Gimmelwald – where it truly feels like Heidiland. Gimmelwald is about 20-25 minutes downhill walk from Murren. I will recommend that you skip Murren for dinner and instead walk down to one of the hostel/restaurants in Gimmelwald where you can enjoy a nice dinner but more importantly sunset views of the peaks which feel immensely close from Gimmewald. Last time I was there, I was so amazed by reflection of the moon light on the mountains that I – with seconds (talk about Swiss punctuality!) – missed the last cable car down to Lauterbrunnen and had to stay at the hostel up there. Once in Gimmelwald, you do not have to walk back to Murren and you can get another cable car down to the Lauterbrunnen Valley from where you can either walk or catch a bus to Lauterbrunnen town. When in Lauterbrunnen, I stay at Hotel Oberland which is clean but not particularly special. It is in the center of the town and also runs its own restaurant. Most of the hotel selections are similar to each other in Lauterbrunnen – clean but not design wonders. While I am very fond of nice hotels, I do not mind this in Lauterbrunnen as you are nearly never indoors in anyways. Lauterbrunnen means “numerous springs” and it makes sense as Lauterbrunnen Valley is full of waterfalls (72 in total!) with the biggest ones being in Trümmelbach Falls. Trümmelbach Falls is a 20-25 minutes bike ride from the town and you can also take the public bus there. There are ten different waterfall galleries in Trümmelbach which are all included in the ticket price (which costs around USD 10). They take you up to the first floor in an elevator from where you take the stairs to all ten galleries. 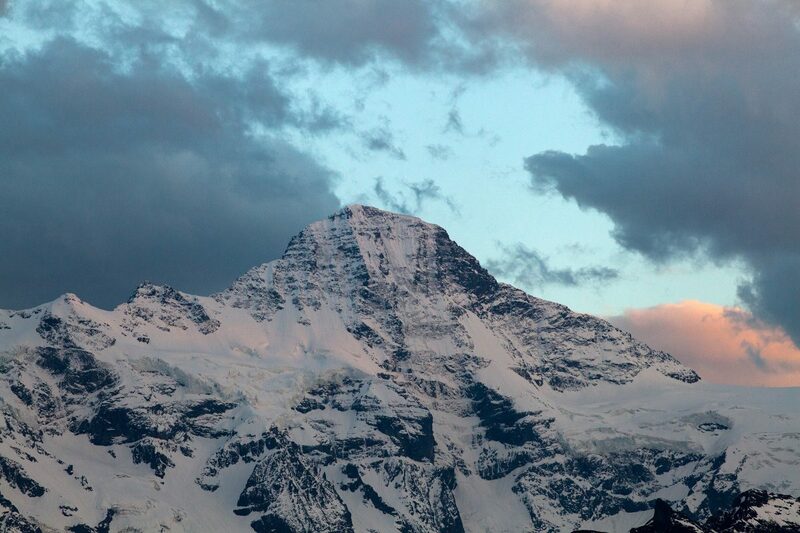 I will share a personal moment right here – this above photo is taken from Gimmelwald when sitting out at a small hostel run restaurant and watching the clouds slowly covering the peaks. At the time – I was hooked on the this beautifully written Paper Stars song called “Once Upon a Time” and it was sure a precious moment when this paraglider appeared up in the sky and I watched the whole view listening to Once Upon a Time – the lyrics goes like – “above the clouds, nothing is loud, it just goes like whoaa whooaa”. As seen in the above photo, Lauterbrunnen Valley is home to numerous adventure sports such as paragliding and mountain biking. I hear that it is also considered to be the mecca for wingsuit jumpers. While I find the latter to be a sport (maybe not even a sport?) which pushes it little too much (given the high causality rates) – it is sure interesting to look up the sky and see human birds. Last time I was in Lauterbrunnen, I was out at around 7 am riding my bike through the valley when I spotted two human birds flying above me and gently making it to the ground to land right in the middle of the group of cows. Those two guys had just jumped of a cliff (without deploying their parachutes until the very last moments) but they looked like they just got back from an easy morning stroll as opposed to an activity commonly considered to be the most dangerous sport on Earth. 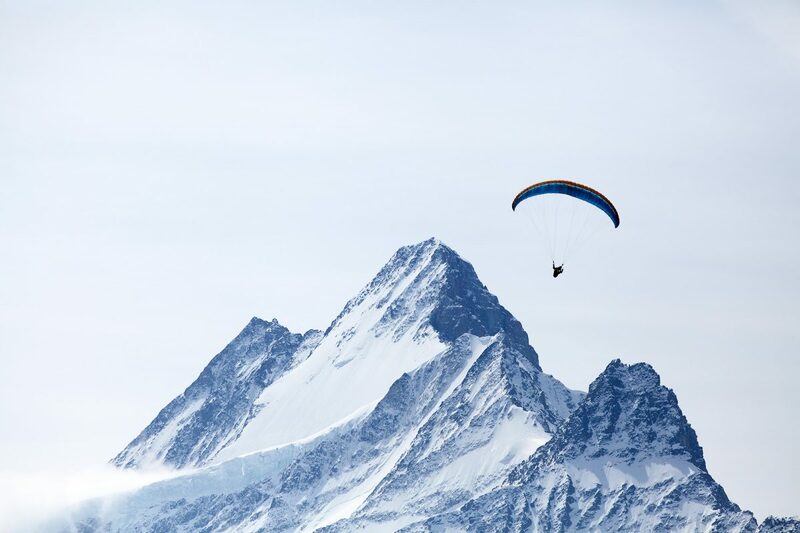 It was also around the time when one of the most famous wingsuit jumpers, Dean Potter, has passed away during a wingsuit accident in Yosemite Valley in USA and I understand Lauterbrunnen was also his favorite spot for wingsuit jumps and also free solo climbs (including Eiger!). If you are looking for a tranquil weekend and you are for up hikes/bike rides in beautiful surroundings – Lauterbrunnen is the place to go. There are numerous hikes ranging from easy to difficult and the roads are so well marked that it is practically impossible to get lost. I would recommend to go during May or in the beginning of June as I understand that the area gets quite packed during the main summer season. You can click here for my Switzerland photo gallery.